Before the nightmare, Yeong-hye and her husband lived an ordinary life. But when splintering, blood-soaked images start haunting her thoughts, Yeong-hye decides to purge her mind and renounce eating meat. In a country where societal mores are strictly obeyed, Yeong-hye's decision to embrace a more “plant-like” existence is a shocking act of subversion. And as her passive rebellion manifests in ever more extreme and frightening forms, scandal, abuse, and estrangement begin to send Yeong-hye spiraling deep into the spaces of her fantasy. 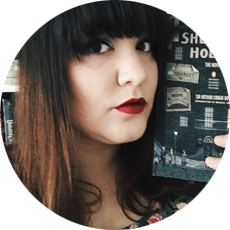 In a complete metamorphosis of both mind and body, her now dangerous endeavor will take Yeong-hye—impossibly, ecstatically, tragically—far from her once-known self altogether. 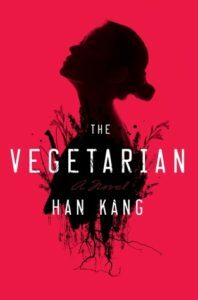 A disturbing, yet beautifully composed narrative told in three parts, The Vegetarian is an allegorical novel about modern day South Korea, but also a story of obsession, choice, and our faltering attempts to understand others, from one imprisoned body to another. Han Kang’s The Vegetarian is a slim novel that is packed with things and ideas that leave the reader thinking long after the book is closed. While I found the characters and the varying points of view interesting, I found that something was missing. Something that feels lost in translation. I think it’s incredibly impressive that Deborah Smith studied Korean for seven years and then translated this book, but I think that her limits definitely showed in her translation. Some parts of it felt clunky, and some parts of it felt skimmed over. What I felt was lacking was a cultural significance as to why the members of Yeong-hye’s family found her vegetarianism so fundamentally shocking. But most of all, I liked the different insights from other people in Yeong-hye’s life. I thought it showcased the difficulties one woman faced in the midst of a very personal decision. Her decision was never taken seriously, no matter what her reasons were for making it. Yeong-hye lost everything because of her fastidious decision to become a vegetarian, and her decision affected her entire family, essentially cracking the family’s foundation. It’s a short novel, and it’s certainly worth reading if you enjoy reading prize-winners, international/translated fiction, and fiction about the lives of women in the aftermath of the choices they make.